Tommy Durand's drive and finish gives Arrowhead a 63-62 lead with 6.3 seconds left in OT. Well, this is good hoops. Brookfield Central goes up one and Arrowhead answers. Arrowhead up 63-62, 6.3 seconds left. Alec Hamilton with a big block on Cole Nau. And then Andres Peralta-Werns comes up just short at buzzer. Arrowhead moves on, 63-62. Arrowhead will play for the state championship after an all time classic semifinal against Brookfield Central. 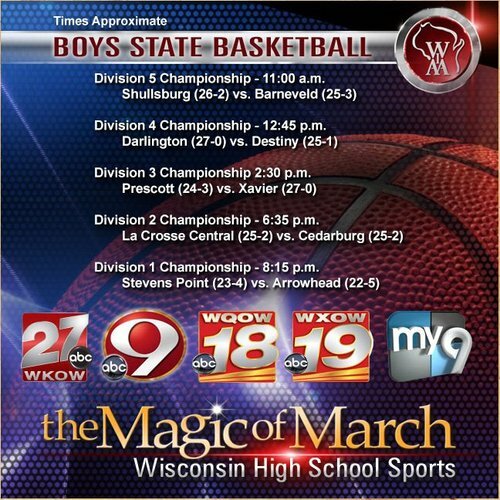 Arrowhead (22-5) vs. Stevens Point (23-4) for the Division 1 title on Saturday. Alec Hamilton of Arrowhead swats potential game-winning hoop. BC had 0.8 but didn't take TO. Got good look on inbounds but no good. I figured Brookfield Central would take a timeout on last inbounds w/ 0.8 left but they didn't and I missed filming. No good though. In OT @Arrowheadschool defeats Brookfield Central 63-62 to move on to the D1 Championship @ 8:15 tom. Marquette had two problems: simply handing the ball to the other team on various occasions and Sindarious.